When the President of the united States travels, the aircraft he flies in becomes Air Force One for the duration of the flight. 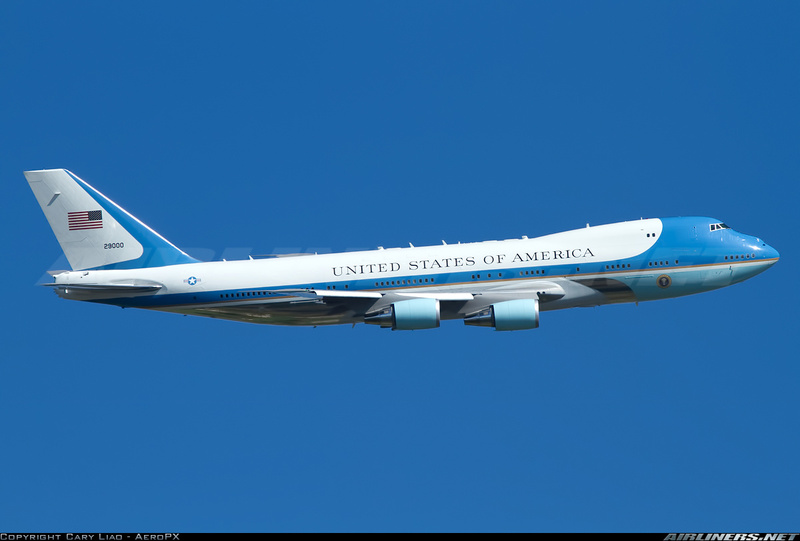 Most people associate the name with two VC-25s which have flown Presidents since 1990. The current aircraft are nearing the ends of their service lives, and more economical replacements are being sought. The VC-25 is a highly modified 747-200B incorporating certain design features from the 747-400 plus a number of Electronic Warfare systems, jammers, flares and decoys. It contains a living suite for the President, galleys, meeting rooms, secure communications equipment, the “Flying Oval Office”, medical facilities and First Class seating for selected members of the Press who accompany the President on his travels. Like its full-sized counterpart, this kit is a monster. It comes packed in a very large top-opening box. The fuselage and wing mouldings are correct for the VC-25, differing from Dragons' previously issued 474-400 despite the box title. The instruction leaflet is one piece of 11 X 17 paper, folded into 4 pages. The assembly steps are printed very small. As with all Dragon instructions recently, there are absolutely no colour call-outs for the interior at all. Since this model has a very complex interior, I find that inexcusable. The exterior painting and marking instructions are left to one small portion of the rear page, and are barely adequate, more reminiscent of instructions from the 1960s rather than 2012. A figure of the President is included, to be displayed at the top of the airstair truck. In a somewhat politically insensitive move, the painting instructions suggest that his face should be painted “flesh”. The clear styrene fuselage is two halves from nose to tail. Strangely enough, the windows are moulded open even though the entire fuselage is clear. There are no window parts to put in them, so they'll have to be filled with Clearfix or Krystal Clear. A very complete interior is provided, and the main and lower deck forward passenger doors may be left open to display some of it. The clear fuselage allows for a “cutaway” paint job should the builder wish. There should be a small forest of communication antennae along the fuselage centreline. Only the 3 largest are provided leaving the modeller to make all the rest from plastic card. Also missing are the ECM antennae on the tailcone. The very complicated interior will take some time to assemble and paint. For the truly adventurous, an LED lighting system could be installed to show off the interior to its best advantage. The inflight refuelling equipment fairing is moulded onto the fuselage halves. Should you wish to convert the model into a passenger 747, this would have to be filled from behind and sanded off. The lower deck entry doors on the port side would also need to be filled in. The wings are two halves for each side. There is a clear styrene insert in the upper surface of the port wing to allow the moulded in rib and spar detail to be seen. To me it looks a bit gimicky, out of scale, and not nearly as complex as the actual wing construction should be. It may be the basis of a superdetailer's paradise, but could just as easily have been left out. The prominent HF Communication antennae are missing from the wingtips and will have to be fabricated. Each horizontal stabiliser is made up of a top and bottom half. They should be left off until after painting and decalling. Once again a clear insert reveals chunky interior detail. The VC-25 is unique among 747 aircraft in having HF antennae which point forward from each stabiliser tip. These are also missing. The VC-25's GE CF-6 engines are quite complicated. The hot and cold sections are one piece each, made with slide mould technology allowing for a centre brace to which the hot section and fan attach. The forward fans are moulded with spaces between each fan blade through which you may look deeper into the engine. Two of the engines are moulded with spurious engine detail on the fan cowling which is to be covered by clear inserts. They should be puttied and painted over. The very prominent IR decoy systems at the top rear of each pylon are missing, so they'll have to be scratchbuilt. The engines are more representative of a 747-400's cowlings, so if you wish to convert your VC-25 into a 747-200 in airline service, you'll need to replace them with aftermarket engines. Welsh Models has recently released a nice set of JT-9D engines which would work. The landing gear struts and wheels may be installed extended or retracted. It may be possible to make them interchangeable, so the model may be optionally displayed on its stand or on its wheels. They're a bit toy-like and chunky, but they'll serve to keep it off the ground. There is only one set of markings, with serial numbers for SAM 28000 and SAM 29000. Only the gold pinstripe of the cheatline is provided, leaving the dark and light blue to be masked and painted. The tail trim is provided, which at least allows for a paint match to be attempted. The blue on the decals looks quite a bit lighter than the picture on the box top but matches well to other photographs. Air Force One posing for a glamour shot against a pristine background. President Obama was aboard at the time the picture was taken, making SAM 29000 Air Force One. Lows: Missing details, and clumsy gimicky, toy-like “extra details” may put serious modellers off. Barely adequate instructions. Verdict: This will be a popular model with American kids. Serious modellers will need extra references to do the subject justice.